Quinn: The Protectors travel to Spain in order to track down one of the world's most ruthless men. Bagman: In Copenhagen, the Protectors chase a criminal and end up confronting him in an old fort. Fighting Fund: In order to get money to purchase weapons a terrorist organization steals a priceless art collection which they intend to sell to the highest bidder. The Last Frontier: The Protectors smuggle a Russian scientist into England. Baubles, Bangles and Beads: In Denmark, a double cross in a jewel theft places a man and his daughter on the most wanted lists of the partners they swindled and of the Protectors. Petard: The Protectors go after industrial spies. Goodbye George: The Contessa goes to Venice in order to find out what happened to George. Wam Part One : The Protectors must rescue a group of vacationers whom are being held hostage on top of an Austrian mountain yet have no idea that they are being held hostage. Wam Part Two: The Protectors must rescue a group of vacationers whom are being held hostage on top of an Austrian mountain- yet have no idea that they are being held hostage. Dragon Chase: Harry must protect a Russian writer who has just been smuggled into England. Decoy: Harry and the Contessa are threatened by a man both thought was dead. Border Line: A Hungarian actress seeks the Protectors help in smuggling the body of her father, an exiled patriot, back into Hungary for burial. Zeke's Blues: A pianist whom Harry was friend's with in college gets blackmailed by an underworld boss into setting Harry up. Lena: Harry and the Contessa must find a man who is presumed to be dead to help a female journalist who is investigating a Venician politician who is a suspected murderer. The Bridge: Harry must masquerade as an explosives expert to rescue a kidnapped girl and prevent a bridge from being blown up. Sugar and Spice: In order to protect the girl, Harry poses as the tutor to the daughter of a rich industrialist who has received threats against her life. 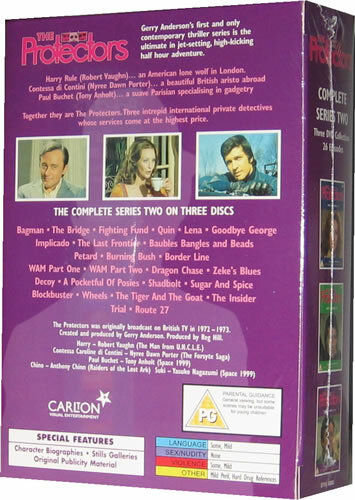 Burning Bush: Harry becomes involved with the occult when he investigates the disappearance of a Canadian heiress. The Tiger and the Goat: The Contessa ends up as the bait in a trap to lure an assassin out into the open. Route 27: Harry confronts drug runners at a harbor brewery. Trial: The Protectors go after the demented man who they believe is responsible for an attempt on the life of the judge who is on the bench of his son's murder trial. Shadbolt: A train ride gives Harry little time to relax when one of the other passengers turns out to be a professional assassin who has accepted a contract to kill Harry. A Pocketful of Posies: A popular singer thinks that she is going crazy when ghosts start to terrorize her. Wheels: While on the trail of thieves who have stolen secret Swiss bank account information Harry ends up as at a motor rally where he becomes a participant. The Insider: The Protectors must recover the negative and all the prints of a movie that are being held for ransom by a mysterious man. 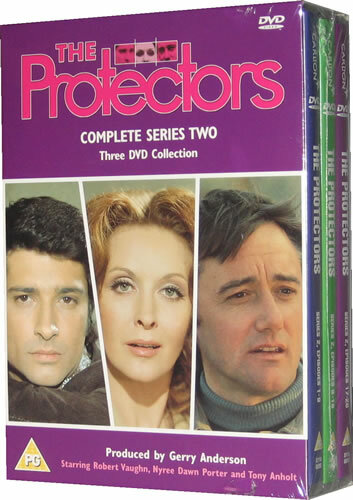 Blockbuster: The Protectors go after a missing platinum shipment.